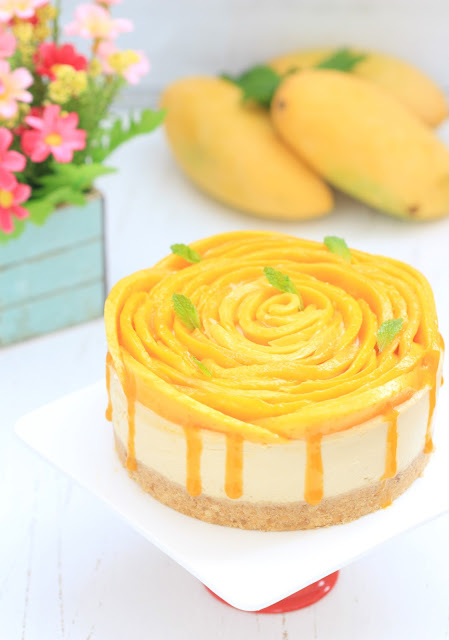 my bare cupboard: Baked mango cheesecake "
Philippine mangoes are arguably the best in the world. It's my 2nd baked mango cheesecake since I made a mess out of the first attempt. For someone who bake cheesecakes for years without a problem, seeing that baked cheesecake crumpled in front of my greedy eyes was a bit disconcerting 😀 I was used in baking cheesecake where recipes doesn't contain much liquid, just eggs or lemon so baking time is much shorter. I baked this 6-inch cake for more than an hour and texture is almost perfect so my cheesecake world is right again lol Unlike my previous baked cheesecakes where I always place the pan one rack above the water bath so no water can seep into the cheesecake mixture, this time, I put it onto another bigger seamless pan and placed that pan directly into the water bath. I should have added more mangoes to the batter! For the toppings, I spread some whipped cream before arranging the mango slices. The mangoes that I used though were not so plump and on a small side, so the rose-shaped design looks a bit short. I actually had to redo the first rose-shaped design as it looks really ugly! 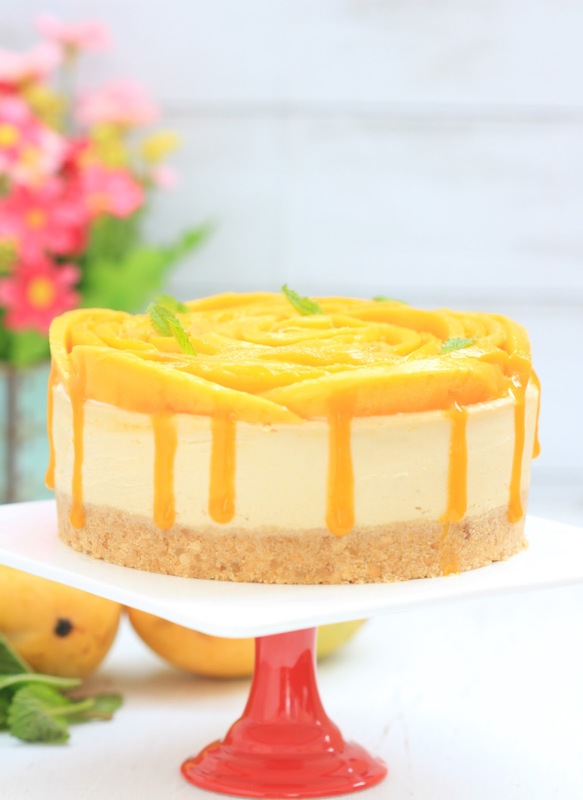 If you want to try the recipe, especially if you like your cheesecake sweet, add more condensed milk and definitely add more mangoes to the batter! If you can find good-quality mango paste, add 1 teaspoon to the batter as well. * Butter the sides and bottom of a 6-inch (loose-bottom) pan and line base with parchment paper. * Combine ingredients above in mixing bowl and mix thoroughly. Press crumbs into the prepared pan, use a spoon to smoothen the surface. Freeze or chill in the fridge for about 30 minutes until it hardens. * Preheat oven to 160ºC. * In a mixing bowl, combine cream cheese and condensed milk; beat until blended, add in sour cream and salt, mix until smooth. Add the egg and beat until just combined. Stir in lime juice and purée, mix well. Pour into the crust. 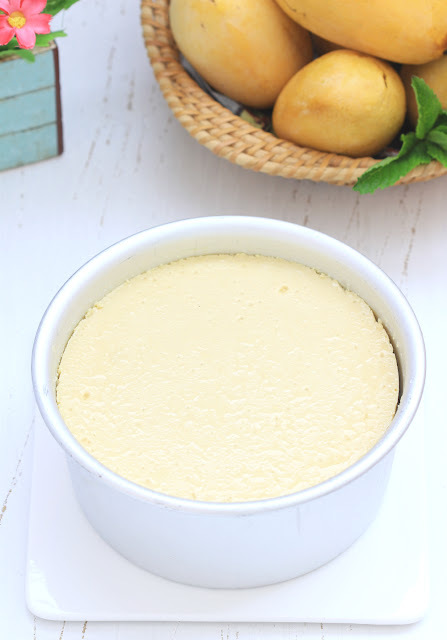 * Bake in a water batch for 50 minutes (cover top of the pan with foil after 40-50 minutes of baking if you want a light colour cheesecake), lower temperature to 140ºC and continue to bake for another 40 minutes. Turn off oven, open door slightly to release steam. Let cool for 2 hours or completely before removing pan from oven. Once cool, chill in the fridge for at least 4 hours, preferably overnight. Note: Every oven is different, please adjust temp and time accordingly. * Beat cream and sugar together until stiff peaks form, do not over beat. Chill until needed. * Un-mould cheesecake and place on a serving plate, pipe or spread whipped cream on top of the cheesecake. 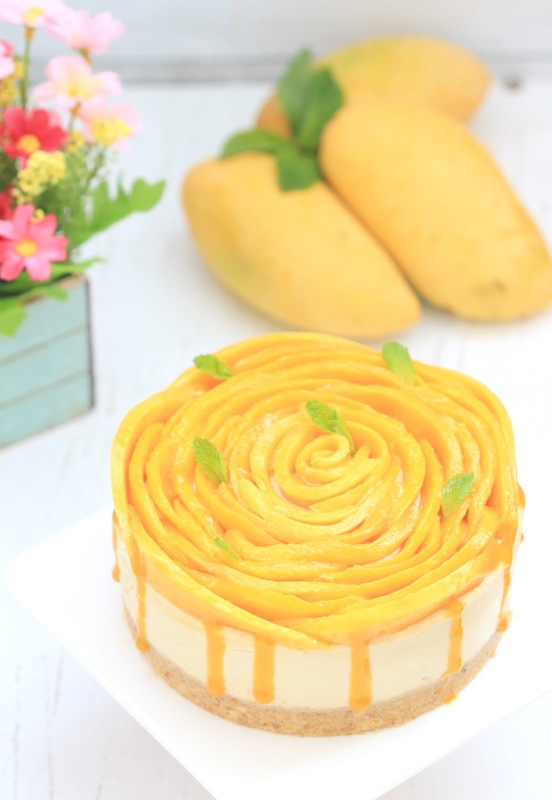 * Decorate top with mango slices. 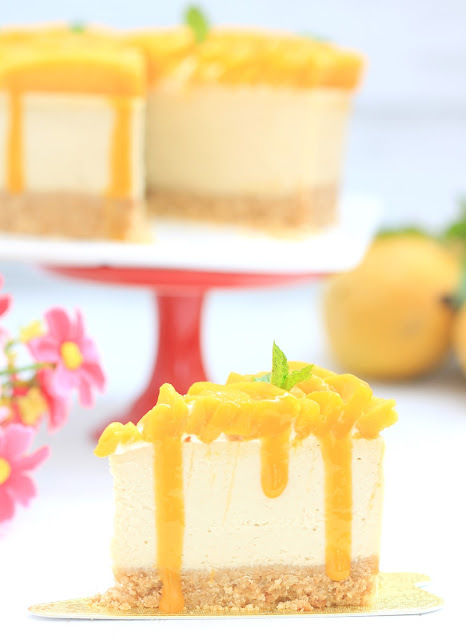 Spoon in mango compote along the sides of the cake. * Chill in the fridge for about 30 minutes before serving. I have tasted mangoes in Manila and I must say that they are the BEST that I have ever had, Anne. Your cheesecake looks heavenly!